“Great rooms, wonderful design, pleasant staff” A bit hard to find when your plane lands at midnight and you don't speak Arabic, but we made do. The markets can be stressful with all the haggling, but coming back to this riad was always a relief. Staff were very accommodating and made wonderful food. we were at dar damlil twice on out one week trio to morocco. at the beginning 3 nights and at the end 2 nights again because we had auch a good time there. we felt really safe and the staff was so nice and helpful. the location was great, super close to the big square but still very quiet. it's like a hidden gem we found! 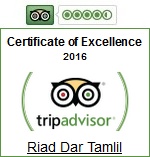 “Lovely” I really enjoyed staying at Riad Dar Tamlil. The room was very pretty and clean with a little sitting area, lovely coloured glass windows and comfy bed. Staff has been very friendly and helpful. Absolutely loved the breakfast! On our last day we left at 7 in the morning to go on a desert tour and despite being before their breakfast hours they brought us room service with all the usual delicious pancakes and croissants and olives coffie and tea! The roof terrace is very nice and I particularly liked the courtyard. Highly recomended! “Doen!! !” Mijn vriend en ik hadden dit Riad via tripadvisor gevonden. We hadden heel veel goede recensies gelezen dus we besloten het te doen. Al snel was er mailcontact met het Riad en vanaf dat moment voelde alles heel vertrouwd. Omdat we 7 nachten in het Riad verbleven, werden we gratis opgehaald vanaf het vliegveld. Er stond iemand klaar met een bordje. Super geregeld! We werden vriendelijk ontvangen met een kopje thee. We zijn zeer tevreden over het Riad. Het Riad is schoon, er is vriendelijk personeel & we hadden elke dag een heerlijk ontbijt! Het is een kleine Riad met 4 slaapkamer, dit maakt het erg persoonlijk. Het Riad ligt echt op 3 minuten afstand van het Jemaa el fna. Daar is het zo druk!! Zodra je het Riad inkomt is het rustig en merk je niks van de drukte buiten! Het personeel is heel flexibel; we hadden een dagtrip waardoor we vroeger wilden ontbijten dan de oorspronkelijke ontbijttijden. Dit was allemaal geen probleem! We voelden ons veilig en op ons gemak. De voordeur is altijd dicht, zodat er geen "vreemde" mensen binnen kunnen komen. Ik heb geen minpunten ik kan alleen maar zeggen dat ik dit Riad iedereen kan aanbevelen!! Riad dar tamlil bedankt voor alles!! “Pequeñito, centro desayuno muy bueno.” Esta en un callejon a dos calles del centro de la plaza Yamaa el Fna , muy buena ubicacion, las habitaciones sencillas pero limpias,yo fui ha una triple y muy amplia. Un patio central donde desayunas una pasta, tostadas, mermelada y mantequilla....cafe y zumo de naranja natural.. Si vuelvo me alojare en el mismo hotel. “delightful place to bstay” i spent a week at riad tamlil and was really pleased we booked it. The location is fantastic. so close to the square and yet once you step inside it feels like a 100 miles away the riad is so tranquil and peaceful.It doesnt set out to be high end accomodation but i found it clean and comfy enough, with lovely friendly staff. Abdul went out of his way to make sure we were content. the taxi transfer they arranged for us was excellent, making sure we got there safly and comfortably. Room 4 was a basic twein room, witha small ensuite.we didnt use AC ,not sure if it worked but it is very high up and staff would need to turn in on for you. the room was secure with an authentic morroacn design. the riad garden was sweet and cool and populated with lovely birds. the terrace gaden was lovely and warm and ideal for breakfast, wfich included local maroc bread and jams, and a coffee and croisant. the staff were helpful in advising and guiding us and the tour guide they linked us to seemed to provide good well priced tours. dont beliweve any tourguides when they talk about accessibility, if you have limited health the morrocan and Uk understanding of suitable is different. if you have mobility problems pretty much all the riads will be difficult, but Tamlil, with a short 2 min walk to the square, which is full of taxis and toctocs is probably the best I could have got and real value for money. it also has a ground floor room, which is good and morrocan staircases are often steep and narrow. In the medina you cannot avoid uneven paths, but people are friendly and kind and I couldnt imagine a more comfortable stay than Tamlil.We felt very safe in the area Abdul provides cooking at a very reasonable price and his tagine was the best i had during my stay. I would definately return here and recommend it to friends.